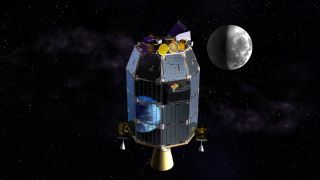 This is an artist's depiction of NASA's Lunar Atmosphere and Dust Environment Explorer (LADEE) observatory in space with the moon in the distance. Image released July 23, 2013. UPDATE for Sept. 7:NASA's LADEE moon mission has launched on its way. You can see amazing LADEE launch photos by skywatchers here. For our launch story, visit here. NASA's next mission to the moon is set to blast off from Virginia's Eastern Shore on Friday (Sept. 6), but if you can't see the launch in person, don't fret. You can watch the rocket soar moonward live online. The nighttime launch of NASA's Lunar Atmosphere and Dust Environment Explorer (LADEE) spacecraft is currently scheduled for Friday at 11:27 p.m. EDT (0327 Sept. 7 GMT). The mission will lift off from NASA's Wallops Flight Facility on Wallops Island, Va., and you can watch its flight thanks to smartphone apps, viewing maps and several agency-sponsored special events. NASA will provide two live webcasts of the launch beginning at 9:30 p.m. EDT (0130 Sept. 7 GMT) via NASA TV. NASA's public and media channels will broadcast live coverage and commentary about the mission while the education channel will host a NASA EDGE webcast about the moon probe. You can watch the LADEE launch live on SPACE.com here, courtesy of NASA TV. Observers in Virginia can watch the LADEE moon mission launch from two locations on Friday. Visitors can see the event from Beach Road between Chincoteague and Assateague Islands or Robert Reed Park on Chincoteague not far from the launch site, according to a NASA description. Both events will feature a live countdown and broadcast of the launch as well as NASA officials on hand to answer questions about the $280 million LADEE mission. The "What's Up at Wallops" smartphone app and LADEE launch sky maps here can also be used to help observers along the East Coast track and, weather permitting, see the rocket as it launches into space. Editor's note: If you take an amazing photo of the LADEE launch or any other night sky view that you'd like to share for a possible story or image gallery, send photos, comments and your name and location to managing editor Tariq Malik at spacephotos@space.com. Space enthusiasts on the West Coast of the United States can also take part in the LADEE festivities. NASA's Ames Research Center in Moffett Field, Calif., which will oversee LADEE mission operations once the probe launches, will host "NASA Ames Science Night" in honor of the mission. The Ames LADEE event is scheduled for Friday from 5 p.m. to 9 p.m. PDT with the launch expected to occur at 8:27 p.m. PDT. Science Night will at Shenandoah Plaza at NASA Research Park in Moffett Field, Calif.
You can find more LADEE events across the U.S. by checking out NASA's New Moon Toolkit website, where you can also list your own launch event for the moon mission. NASA will host online events counting down to LADEE's moon shot throughout the week.NASA TV will air two back-to-back pre-launch news conferences on Thursday beginning at 3 p.m. EDT (1900 GMT) and running until 4:45 p.m. EDT (2045 GMT). The first conference will include information about the weather and outlook for the probe's launch and the second will detail the science objectives for LADEE. Live media interviews about the LADEE mission, including an interview with SPACE.com, will be webcast on NASA TV on Friday from 4 p.m. to 6 p.m. EDT (2000 to 2200 GMT). SPACE.com partner Spaceflight Now is also providing blow-by-blow coverage of LADEE's mission via the Mission Status Center, which will also include a launch webcast feed.